Latest Eurostat labour costs statistics are out. 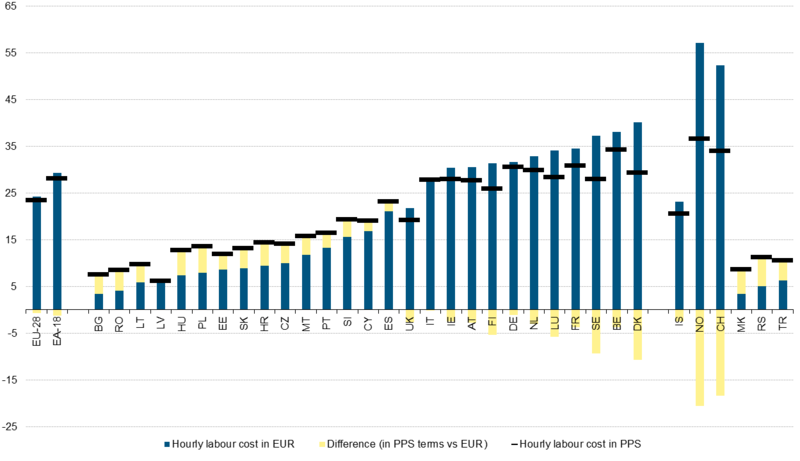 The first figure shows the regional variation of hourly labour costs expressed in euros in 2012. Most – though not all – Western European regions have average hourly costs superior to 30 Euros while Eastern European regions (including parts of Eastern Germany) all have less than 10 Euros average hourly costs. In between those two groups lie parts of Spain and parts of the UK, as well as Portugal, with between 10 and 20 Euros average hourly costs. The second figure shows national differences in hourly costs expressed in Euros as well as adjusted for purchasing power (i.e. differences in cost of living in different countries). Not surprisingly, the variation in purchasing power terms is lower but does not erase cross-national differences. It’s also interesting to note that the UK – where the immigration debate is currently heavily skewed against immigration – average hourly labour costs adjusted are lower than than the EU28 average. Tired of hearing that UK benefits are too generous? Read and share my latest post at the New Trade Unions Forum! Does the UK really spends too much on labour market policies? Consistent with previous trends in reforms of labour market policies, the UK government has announced yet another restriction on unemployment benefit claimants. The striking thing about these reforms is not that they are unlikely to be effective, nor that even if they were effective they probably wouldn’t make much of a difference in reducing the unemployment rate. Instead, the main issue is that they completely misrepresent the nature and extent of the problem. Two sets of claims generally underpin the rhetoric of these reforms. The first is that benefit recipients fraud and that one must therefore restrict their access to prevent them from doing so. 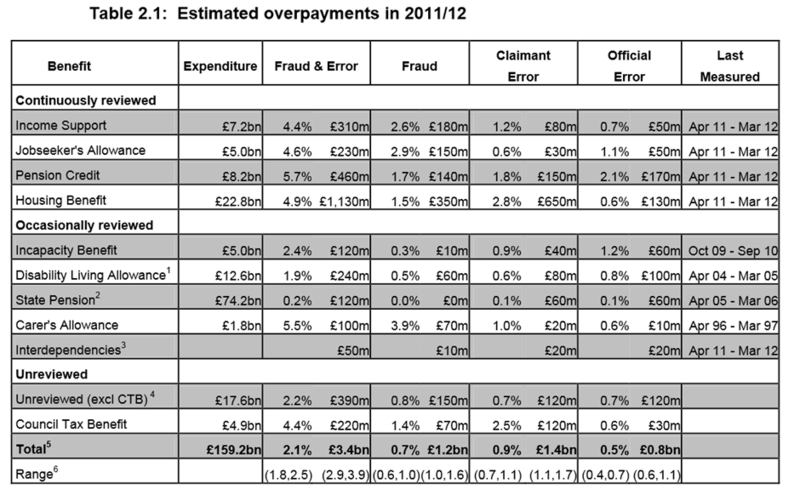 As official statistics (see page 13) themselves reveal, the amount of fraud is in fact very low: fraud cost only about 2.6% of expenditure on income support and 2.9% of spending on Job seeker allowance (see table below). The second claim is that these policies simply cost too much and that the system is too generous in the UK. To assess the validity of this perception, I look at 2009 spending data on various labour market policies (from the OECD statistics website). One should distinguish between so called active labour market policies that include training schemes, employment incentives, rehabilitation programs, etc, and passive labour market policies that are mainly composed of traditional unemployment benefits. Starting with the former, the table below shows that the UK ranks 21st among developed countries in terms of spending on active labour market policies expressed as a percentage of GDP. Scandinavian countries and continental European countries spend important amounts on these policies, while the US, Australia and Canada, along with some eastern European countries spend much less. 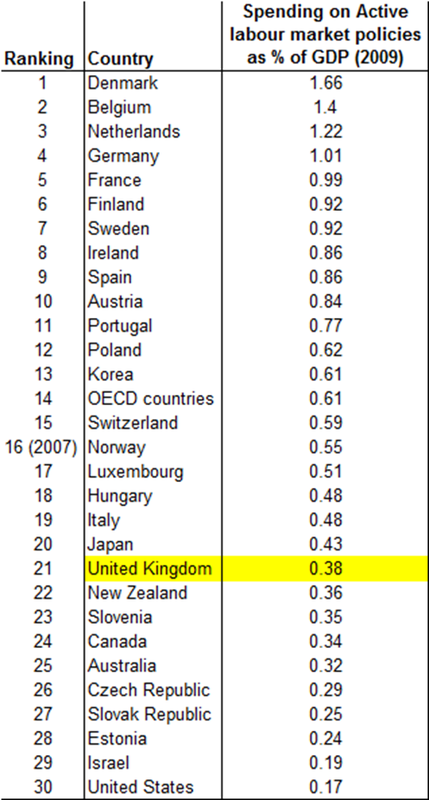 With respect to passive labour market policies (again expressed as a percentage of GDP), the UK ranks 31st among developed countries… If one divides the spending on these policies by the unemployment rate to get a measure of relative ‘effort’ given the ‘need’, the picture still looks bleak for the UK’s unemployed. Of course there is significant evidence that the design of unemployment benefits (and other social policies) has important effects on recipients’ incentives to return to work. But the paradox is that as one reduces the amount that unemployed can claim, their incentive to actively seek work to avoid losing benefits actually falls (i.e. the cost of non-compliance with benefit schemes’ requirements decreases as the amount of the benefit is reduced). My latest paper on the politics of temporary work regulation in Western Europe. Temporary work has expanded in the last three decades with adverse implications for inequalities. Because temporary workers are a constituency that is unlikely to impose political costs, governments often choose to reduce temporary work regulations. While most European countries have indeed implemented such reforms, France went in the opposite direction, despite having both rigid labor markets and high unemployment. My argument to solve this puzzle is that where replaceability is high, workers in permanent and temporary contracts have overlapping interests, and governments choose to regulate temporary work to protect permanent workers. In turn, replaceability is higher where permanent workers’ skills are general and wage coordination is low. Logistic regression analysis of the determinants of replaceability— and how this affects governments’ reforms of temporary work regulations—supports my argument. Process tracing of French reforms also confirm that the left has tightened temporary work regulations to compensate for the high replaceability. This article examines the problems of the single currency in light of the organization of labour relations in the Member States and their interaction with monetary policies. 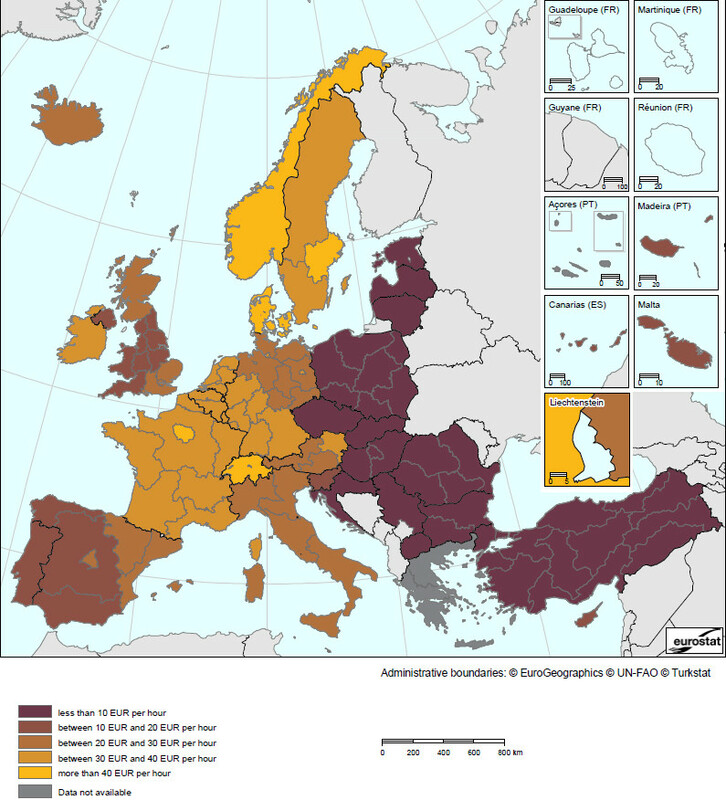 Continental (western) Europe consists of two very different systems of employment and labour relations, roughly coinciding with ‘coordinated market economies’ in the north-west of the continent, and ‘Mixed Market Economies’ in the south. These differences in employment relations and wage-setting systems implied that, against the background of a relatively restrictive one-size-fits-all monetary policy in place since 1999, the north-west of the continent systematically improved its competitiveness, while the south lost competitiveness in parallel. Small differences between the two groups of countries at the start of EMU thus were accentuated and, against the background of low growth and an almost closed E(M)U economy, the northern coordinated market economies accumulated current account surpluses while the GIIPS (Greece, Italy, Ireland, Portugal and Spain) ran into severe balance of payments problems in 2010 and 2011. This recent issue covers the introduction of patient choice in Sweden. Two articles discuss the effect of macroeconomic conditions and pre-existing welfare state institutions on demands for redistribution and preferences for welfare state policies, respectively. 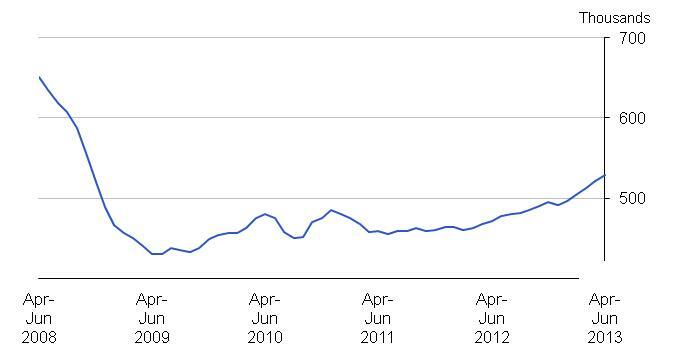 The effect of credit markets on homelessness and the temporarily of poverty are also investigated. Last but not least, the article by Marx and Picot looks at the preferences of precarious workers as compared to those in permanent employment, while Schmitt, C. and H. Obinger investigate the process of policy diffusion and interpendence for three welfare state policies. Fredriksson, M., P. Blomqvist, et al. (2013). “The trade-off between choice and equity: Swedish policymakers’ arguments when introducing patient choice.” Journal of European Social Policy 23(2): 192-209. How do policymakers deal with the tension between choice and equity in healthcare? An analysis and critical examination of Swedish policymakers’ arguments when introducing legislated choice of primary care provider in 2010 shows that even when deciding on a reform with a potentially great impact on distribution of health resources, implications for equity were not systematically addressed. Effects with regards to current patterns of healthcare consumption in the population as well as existing inequalities in health outcomes were not adequately addressed. Neither was the primary are choice reform, which is based on the values of consumerism and individual choice, problematized in relation to current healthcare legislation such as the Health and Medical Services Act. Given that the values of equity and social solidarity have had such a prominent place in Swedish health policy and discourse in past decades, this is a surprising finding. In conclusion, we argue that because inequalities in health constitute one of the main challenges for public health today, the impact of healthcare reforms on equity should receive more attention in policymaking. Jæger, M. M. (2013). “The effect of macroeconomic and social conditions on the demand for redistribution: A pseudo panel approach.” Journal of European Social Policy 23(2): 149-163. This paper analyses the effect of macroeconomic and social conditions on the demand for redistribution. Using a synthetic cohort design to generate panel data at the level of socio-demographic groups, analysis of fives waves of data from the European Social Survey (2002–2010) shows that differences across countries in macroeconomic and social conditions have an effect on the demand for redistribution. Consistent with theoretical expectations, economic growth generates a lower demand for redistribution, while higher income inequality generates a higher demand. By contrast, differences across countries in unemployment levels and social expenditure are unrelated to the demand for redistribution. The analysis also suggests that empirical results depend to a considerable extent on the assumptions underlying different methodological approaches. Jordan, J. (2013). “Policy feedback and support for the welfare state.” Journal of European Social Policy 23(2): 134-148. How does the structure of social policy institutions shape the level of public support for the welfare state? The policy feedback literature predicts that highly inclusive welfare institutions generate larger bases of public support by shifting the focus away from redistribution and toward common market insecurities felt across classes, while more selective strategies erode support by highlighting the conflicts of interest imbedded in clearly redistributive social programs. This paper expands on existing research by adopting a disaggregated approach to measuring both welfare state structure and public support, uncovering important cross-program variations in public attitudes and welfare state design masked by traditional measures of universality and public support. This project applies this method to public opinion data in 17 advanced capitalist democracies across three policy areas: healthcare, pensions, and unemployment. The findings offer evidence of policy feedback effects. Lux, M. and M. Mikeszova (2013). “The role of a credit trap on paths to homelessness in the Czech Republic.” Journal of European Social Policy 23(2): 210-223. This briefing paper aims to show the most common paths to homelessness in a post-socialist state: the Czech Republic. Homelessness in the Czech Republic is worthy of examination because the generous provision of social assistance and tenure security in this country has provided a more secure safety net against homelessness than many other EU member states: yet homelessness has still arisen. The theoretical approach applied in this paper attempts to move beyond the structure–agency debate in the homelessness literature by focusing on the characteristics that most homeless people share on their paths to homelessness. Simple associations among factors associated with homelessness cannot provide a definitive account of the causes of homeless; such data can, however, provide invaluable insights into the constellation of factors that are associated with the phenomenon of homelessness. This briefing paper reveals that the pervasiveness of consumer credit has often been a critical juncture on the pathway to homelessness in the Czech Republic, despite the assistance available from a strong welfare state. Marx, P. and G. Picot (2013). “The party preferences of atypical workers in Germany.” Journal of European Social Policy 23(2): 164-178. Are party preferences of atypical workers distinct from those in stable employment? The welfare state literature debates this question, but very few empirical studies have been conducted. We examine the German case, being an example of a welfare state with strong social insurance traditions where the rise of atypical employment has been conspicuous. In particular, we test the argument that preferences of labour market outsiders may not differ because outsiders share households with insiders. We find that labour market status significantly affects party preferences. Compared with standard employees, atypical workers have stronger preferences for small left-wing parties. Living together with a labour market insider neutralizes these party preferences, but this type of household is not very common. Moreover, atypical workers differ from the unemployed by not participating less in elections than insiders. Therefore, it is expedient to distinguish between different types of labour market outsiders. Schmitt, C. and H. Obinger (2013). “Spatial interdependencies and welfare state generosity in Western democracies, 1960–2000.” Journal of European Social Policy 23(2): 119-133. For many years comparative welfare state research has been afflicted with a sort of methodological nationalism in the sense that countries were treated as independent units. In line with the recent ‘spatial turn’ in comparative public policy studies, this paper examines with regard to three welfare state programmes whether, in the post-war period, the provision of social rights in 18 Western democracies was shaped by benefit generosity in other countries. We show that diffusion is present but varies by programme and over time. Rather surprisingly, we find that policy diffusion was particularly relevant during the Golden Age. Snel, E., F. Reelick, et al. (2013). “Time and poverty revisited: A replication of Leisering and Leibfried.” Journal of European Social Policy 23(2): 179-191. In the late 1990s, the German sociologists Leisering and Leibfried (1999) argued that most poverty is of a temporary nature. In their poverty study in the German city of Bremen, Leisering and Leibfried found that more than half of all social assistance claimants were out of poverty within a year. Based on their work, individualization theorists such as Giddens and Beck argue that ‘for most people poverty is only a temporary experience’. This article replicates Leisering and Leibfried’s study using statistical data about social assistance claiming in Rotterdam, the Netherlands. In doing so we find significant numbers of short-term claimants (about 30 percent), as well as surprisingly large numbers of long-term claimants. One in four Rotterdam social assistance claimants is poor for at least 5 years – more than twice as many as Leisering and Leibfried found in their study. We also show that recurrent benefit spells, for Leisering and Leibfried another typical feature of contemporary poverty, is only the exception in Rotterdam. Leisering and Leibfried (and sociologists such as Giddens and Beck in their footsteps) are wrong in claiming that short poverty experiences are typical for poverty in late-modern society. Persistent poverty is still present in our age and in our cities. Ackerman, B. (2013). “Reviving Democratic Citizenship?” Politics & Society 41(2): 309-317. Many of our inherited civic institutions are dead or dying. We need an ambitious reform program to revive democratic life. This essay advances a four-pronged “citizenship agenda”: (1) a campaign finance initiative granting each voter fifty “patriot dollars” to fund candidates and political parties of his or her choice; (2) a proposal for a new national holiday, Deliberation Day, held before each national election, enabling citizens to deliberate on the merits of rival candidates; (3) a system of federally financed electronic news-vouchers to permit professional journalism to survive the destruction of its traditional business model; and (4) a new form of citizenship inheritance, which provides $80,000 to all Americans as they start off life as adults. Working with collaborators, I have developed each of these initiatives at book length. This essay suggests how the “citizenship agenda” yields a whole that is larger than the sum of its parts. Benkler, Y. (2013). “Practical Anarchism: Peer Mutualism, Market Power, and the Fallible State.” Politics & Society 41(2): 213-251. The article considers several working anarchies in the networked environment, and whether they offer a model for improving on the persistent imperfections of markets and states. I explore whether these efforts of peer mutualism in fact offer a sufficient range of capabilities to present a meaningful degree of freedom to those who rely on the capabilities it affords, and whether these practices in fact remain sufficiently nonhierarchical to offer a meaningful space of noncoercive interactions. The real utopias I observe here are perfect on neither dimension. Internally, hierarchy and power reappear, to some extent and in some projects, although they are quite different than the hierarchy of government or corporate organization. Externally, there are some spectacular successes, some failures to thrive, and many ambiguous successes. In all, present experience supports neither triumphalism nor defeatism in the utopian project. Peer models do work, and they do provide a degree of freedom in the capabilities they provide. But there is no inexorable path to greater freedom through voluntary open collaboration. There is a good deal of uncertainty and muddling through. The last part of the article suggests a theory of freedom that supports the significance of even these obviously imperfect peer systems with incomplete coverage of necessary human capabilities, and explains why expanding the domain of mutualism improves freedom and well-being under conditions of persistent market imperfection and an inevitably fallible state. Peer mutualism doesn’t have to be perfect; it merely needs to offer a new dimension or sufficient diversity in how it instantiates capabilities and transmits power to offer us, who inhabit the systems that these peer systems perturb, a degree of freedom. Davis, G. F. (2013). “After the Corporation.” Politics & Society 41(2): 283-308. Shareholder-owned corporations were the central pillars of the US economy in the twentieth century. Due to the success of the shareholder value movement and the widespread “Nikefication” of production, however, public corporations have become less concentrated, less integrated, less interconnected at the top, shorter-lived, and less prevalent since the turn of the twenty-first century, and there is reason to expect that their significance will continue to dwindle. We are left with both pathologies (heightened inequality, lower mobility, and a fragmented social safety net) and new technologies suitable for being repurposed in more democratic forms. Local solutions for producing, distributing, and sharing can provide functional alternatives to corporations for both production and employment; what is needed is the social organization to match the tools that we already have, or will have shortly. The time for democratic local economic forms prophesied by generations of activists may finally be at hand. Fung, A. (2013). “Infotopia: Unleashing the Democratic Power of Transparency.” Politics & Society 41(2): 183-212. Gastil, J. and R. Richards (2013). “Making Direct Democracy Deliberative through Random Assemblies.” Politics & Society 41(2): 253-281. Direct-democratic processes have won popular support but fall far short of the standards of deliberative democracy. Initiative and referendum processes furnish citizens with insufficient information about policy problems, inadequate choices among policy solutions, flawed criteria for choosing among such solutions, and few opportunities for reflection on those choices prior to decision making. We suggest a way to make direct democracy more deliberative by grafting randomly selected citizen assemblies onto existing institutions and practices. After reviewing the problems that beset modern direct-democratic elections and the long history of randomly selected citizen assemblies, we propose five different varieties of randomly constituted citizen bodies—Priority Conferences, Design Panels, Citizens’ Assemblies, Citizens’ Initiative Reviews, and Policy Juries. After selecting members through stratified random sampling of citizens, each of these assemblies would operate at a different stage of the legislative process, from initial problem identification through approval of a finished ballot measure. Highly structured procedures guided by professional moderators and featuring expert testimony on policy and legal matters would help to ensure deliberative quality, and careful institutional designs would make each body politically powerful. In the end, these citizen bodies would be likely to address the deliberative deficit of direct democracy and better achieve the public’s desired policy objectives. Van Parijs, P. (2013). “The Universal Basic Income: Why Utopian Thinking Matters, and How Sociologists Can Contribute to It.” Politics & Society 41(2): 171-182. Utopian thinking consists of formulating proposals for radical reforms, justifying them on the basis of normative principles combined with the best possible scientific analysis of the root causes of the problems the proposals are meant to address, and subjecting these proposals to unindulgent critical scrutiny. Such utopian thinking is indispensable, and contributing to it is part of sociology’s core business. This article illustrates these claims by considering one particular utopian proposal: an unconditional basic income paid to every member of society on an individual basis, without means test or work requirement. It summarizes the main arguments that support this proposal, mentions a number of contexts in which it is being taken seriously, and sketches a number of ways in which sociological insights and research are crucially relevant to the discussion of the economic and political sustainability of an unconditional basic income. What countries offer the most generous replacement of lost income in the event of job loss? And how have governments changed unemployment benefit since the onset of the economic crisis? Thanks to a new dataset assembled by Olaf van Vliet & Koen Caminada (version 1, January 2012), we now have data on unemployment benefit schemes in 34 welfare states from the 1970s until 2009. Below I chart the net replacement rate for an average worker in a one earner household with two children for 2006 and the latest year available in the dataset (2009). First, as is well documented in the welfare state literature, notice the difference compared to the gross replacement rates which I discussed in an older post. In general, gross replacement rates tend to under-estimate the extent to which liberal welfare states such as the US compensate for income loss. Second, one can identify three paths. Southern European countries such as Italy and Greece and European liberal market economies such as the UK and Ireland exhibit increases in their replacement rates. Another group of countries have mildly reduced their replacement rates. This includes eastern European countries such as Slovenia, Estonia, Latvia, Poland and Hungary but also non-EU liberal market economies such as the US and Australia. The scandinavian countries (Denmark, Finland and especially Sweden) have also reduced their unemployment benefit entitlements. Source: Olaf Van Vliet & Koen Caminada (2012), ‘Unemployment replacement rates dataset among 34 welfare states 1971-2009: An update, extension and modification of the Scruggs’ Welfare State Entitlements Data Set’, NEUJOBS Special Report No. 2, Leiden University. New paper on the politics of labour market policies in Western Europe published in the February issue of the Journal of European Social Policy. There are competing theoretical expectations and conflicting empirical results concerning the impact of partisanship on spending on active labour market policies (ALMPs). This paper argues that one should distinguish between different ALMPs. Employment incentives and rehabilitation programmes incentivize the unemployed to accept jobs. Direct job creation reduces the supply of labour by creating non-commercial jobs. Training schemes raise the human capital of the unemployed. Using regression analysis this paper shows that the positions of political parties towards these three types of ALMPs are different. Party preferences also depend on the welfare regime in which parties are located. In Scandinavia, left-wing parties support neither employment incentives nor direct job creation schemes. In continental and Liberal welfare regimes, left-wing parties oppose employment incentives and rehabilitation programmes to a lesser extent and they support direct job creation. There is no impact of partisanship on training. These results reconcile the previously contradictory findings concerning the impact of the Left on ALMPs.